Garbage disposals are very simple appliances that can Garbage Disposal Repair in Chandler, AZ easily. They are attached to the underside of the kitchen sink. Its purpose is to grind up pieces of food and then wash away the excess when the water is turned on. If you encounter a problem with your unit, you are probably familiar with the reset button on the bottom. However, if that does not work, then you may have a bad motor which will need to be replaced. 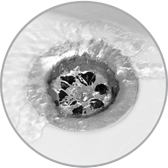 Often, if a large chunk of food becomes stuck near or around the disposal blades, this clogs up the drain hole. Do not keep running the disposal because you could burn the motor out. Also, a disposal may hum along, but it is not grinding. This generally means that the blades are broken, but the fix is a Garbage Disposal Repair in Chandler, AZ. What if you have a leak under the garbage disposal unit, then a gasket or a connector could have failed. Many things can go wrong with a garbage disposal and you can call on us to fix all your disposal needs. Our plumbing technicians offer garbage disposal repair and garbage disposal replacement services. We offer proper maintenance and annual check-ups which go along way to prolong your disposal's life expectancy. When you are not sure what the problem is let our professional plumbing technicians handle any and all your plumbing and garbage disposal repair problems. Garbage Disposal Repair in Chandler, AZ is not a DIY task. It requires experience, training and a knowledge about this important piece of home equipment, electrical wiring and intricate assembly procedure. Whether you need your disposal repaired or you need a brand new garbage disposal, we are your service company. We promise quality service, quality products, quality labor, and quality repair and maintenance of your garbage disposal. Our technicians are highly trained, licensed, and guarantee to help fix all of your garbage disposal requirements.